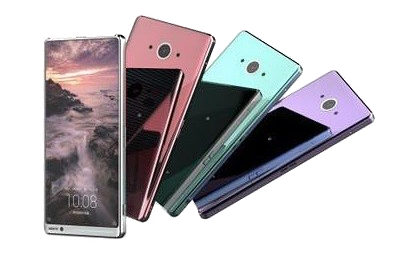 Less than a month after the official launch of the Aquos S2 (in three versions), already a new device, the successor Aquos S3 is rumoured. Designer Blanche Lee (a.k.a. Conceptcreator) has created this concept video based on the leaked image. There has been no offical announcement, however, so all this might turn out to be nothing but wishful thinking. The concept device looks much more streamlined than the Aquos S2. I for one fail to appreciate the inner camera cutout in the top part of the display. The Aquos S3 has extremely thin bezels on all three sides, without the diagonally trimmed top corners, which was a serious design fail IMHO. There is no room for the proximity/light sensors on top, or the earpiece – the former could be located beneath the display, and the bone-conduction technology could be deployed for the latter (as on the Aquos Crystal). But since this is a concept design, we can't be certain of anything – just compare all the wonderfully promising CGIs of the Aquos S2 to the actual product. 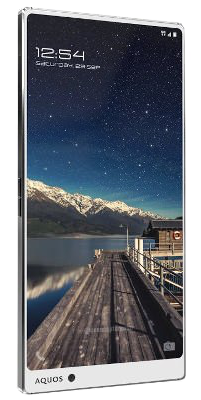 Rumoured specifications include a 5.8-inch display (IZGO) with a resolution of 1440 x 2880 pixels (~555 ppi pixel density). The processor is expected to be the latest top-notch Qualcomm, the Snapdragon 835 (MSM8998) having four 2.35 GHz Kryo cores and four 1.9 GHz Kryo cores, and the Adreno 540 GPU. The operating memory is expected to be hiked up to 6 GB, and the built-in storage memory 64/128 GB, expandable using microSDXH cards of up to 256 GB capacity. Camera: the concept shows a single main camera positioned in the top middle part of the device's back. This should be a 12 MP shooter with phase-detection autofocus, low-light f/1.8 sensor with a 1/2.6" size and 1.4 µm pixel size, which sounds promising but is actually less than the Aquos S2 bragged. The inner camera is the same as on the Aquos S2: 8 MP, f/2.0, 1/3.2" sensor size, 1.4 µm pixel size, but this time positioned in the bottom left bezel, right next to the AQUOS logo. The Aquos S3 will have dual-SIM support. Frequencies and specifications should be the same as on the Aquos S2. The concept design doesn't show a fingerprint scanner. The battery capacity is 3230 mAh. The Aquos S3 is rumoured to measure 143 x 72.8 x 7.3 mm. So far, the only two colours shown in the concept video are black and white. Another leaked CGI image, however, shows metallic red, blue-green, and purple back-covers. The Aquos S3 is expected to become reality later this year or at the start of 2018. Chances are that it will also be launched in Europe and the US as Foxconn have stated they will showcase Sharp smartphones for worldwide sales at the February 2018 Barcelona World Mobile Congress.